A the time Schütz was appointed Kapellmeister at the court in Dresden in 1617 the gospel of Easter was performed each year in a setting by Antonio Scandello, one of Schütz's predecessors in Dresden. Schütz himself performed this setting during his first years in Dresden. It was only in 1623 that Schütz composed his own setting, the 'Auferstehungshistorie', as a replacement for the Scandello. This was was his first contribution to the genre of the 'Historia'. The work linked with tradition, but also contained some significant innovations. 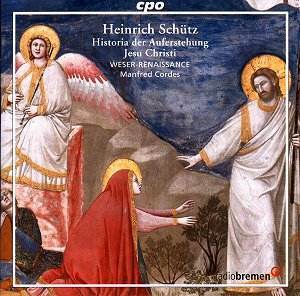 Schütz uses the same text as Scandello, a compilation of the events of Easter from the four gospels, the so-called 'Evangelien-Harmonie' (Harmony of the Gospels), by the Wittenberg reformer Johannes Bugenhagen. He also keeps the traditional recitation model, the 'Easter tone', for the part of the Evangelist. Scandello had set the parts of the individual characters - Jesus, Mary Magdalene and Cleophas - for up to four voices. In Schütz's Historia they are set for two, with the exception of the part of Cleophas, which is given to a soloist. Schütz gave the performers the option of assigning the second part to an instrument or omitting it altogether. This is not the only innovation: the basso continuo was introduced to support the singers. And the objectivity of the traditional Historia was eliminated in favour of a more emotional delivery of the events at Easter. Schütz made use of 'Affekt' and madrigalisms to translate the actions into music and to express the emotions of the characters in the story. Not only the part of the Evangelist reflects this approach, but also the accompaniment, for which Schütz strongly preferred a consort of four viole da gamba. In this way he created a contrast between the Evangelist and the other parts. This is underlined by another of his suggestions regarding the performance: he preferred his Historia to be performed with two choirs, one of them the Evangelist with the consort of viols, the other the 'choir of people'. He also wished only the Evangelist to be seen by the audience, whereas the other participants should be out of sight. In Schütz's music the text is always central. The message - in this case the biblical story of Jesus' resurrection - should be communicated as clearly as possible to the congregation. And this is one of the strengths of this recording: Hans-Jörg Mammel gives an excellent delivery of the Easter story, and the viols support him with great sensitivity. We find here a perfect balance between objectivity and emotion. The parts of the soliloquents and the tutti are performed to the same high standard. This disc also contains four sacred concertos which, in one way or another, are connected to Easter. They start with a piece on a Latin text, 'Surrexit pastor bonus', in the Catholic liturgy a responsory for the second day of Easter, which refers to Christ's passion: "The Good Shepherd is risen, who deemed it fitting to die for his flock". 'Weib, was weinest du' is called a 'dialogo per la pascua' and is a dialogue between Jesus and Mary Magdalene after his resurrection. 'Ich bin die Auferstehung und das Leben' was published in 1639 in the second volume of the 'Kleine Geistliche Konzerte'. It was probably composed for a funeral service, and is a setting of the Gospel of John, ch 11, vv 25-26 (I am the resurrection and the life). The text of the last piece, 'Feget den alten Sauerteig aus' (Sweep out the old leaven), is from the 5th chapter of Paul's First Letter to the Corinthians, which in Schütz's time was the reading for the first day of Easter. The apostle here refers to the Passover: Christ is the Passover lamb which has been sacrificed. All these concertos are given splendid performances. To sum up: these are impressive and idiomatic performances of one of Schütz's masterpieces and some fine sacred concertos for Easter.